Bathroom organization is attainable for all baths regardless of their size. Small bathrooms might face more of a challenge because they need to pack a lot of utility into a tiny footprint. However, there are basic organizational principles every bath should follow. Ideally, you need a space that can store toilet paper, towels, toothbrushes, and other everyday essentials while still looking nice and decluttered. We've collected several bathroom organizing ideas that address small bathroom storage, organizers for larger baths, and some tips and tricks to help you maximize any space. Continue to 2 of 21 below. Companies sell shelving units that are made to fit around standard sized toilets. Stylistically, these are pretty basic looking. However, another option is to build custom open shelves above the toilet for additional storage. Doing it yourself provides more of an opportunity to match the shelving with your style. Continue to 3 of 21 below. This medicine cabinet became much more functional with the addition of three mason jars. By storing items vertically inside a glass, you can make better use of the vertical space inside the cabinet. One bathroom organizing tip to consider is to try to keep like items together. For instance, one jar could be for dental care, one for razors, and another for miscellaneous creams and ointments. Continue to 4 of 21 below. Labeling isn't just for function; it's for style too. When you use streamlined containers with an attractive label, everything looks more appealing and put together. Experiment with a mix of containers, baskets, and apothecary jars that work well together. However, before you purchase any organizing products, sort through all your products and pick out categories first, so you don't buy more than you need. Showers and tub surrounds are infamous for getting cluttered with multiple shampoos and soap bottles. One way to encourage a minimal approach to bath products is to coordinate your bottles. You'll be so caught up keeping your bottles looking photo-ready that you will be less tempted to buy that extra bottle of body wash.
Continue to 6 of 21 below. Any bath with a little extra floor space could benefit from the addition of a tiered tray or tiered basket organizer. Some people use rolling carts for this purpose, but a tiered tray is an elegant and welcoming option. Stock the top two levels with items needed for bathing and store some extra toilet paper at the bottom. A smaller, two-level tiered tray would work well for storage on the bathroom counter. Continue to 7 of 21 below. Think about the items that you reach for every day when you get ready in the bathroom. If you do your make up there, consider attaching some removable storage containers directly to the wall. You can either make a custom caddy or purchase ready-made organizers for this purpose. Just be aware that some stick-on organizers may damage the wall underneath, so you may be better off drilling a few small holes. Continue to 8 of 21 below. One of the most obvious places to keep extra toilet paper is on the back of the toilet. However, there are several ways to make this storage spot more attractive. To make this bathroom organization idea more blog-worthy, find a basket and stack a couple of rows of toilet paper inside. 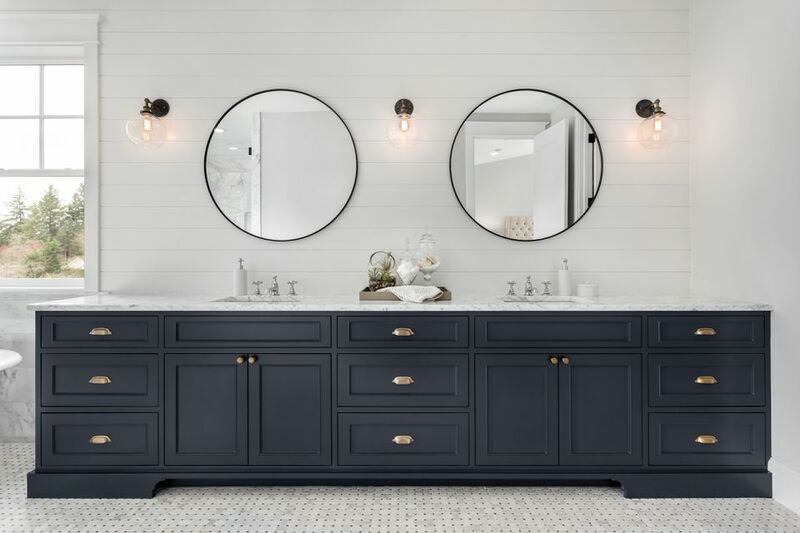 If you have a bathroom with enough floor space, consider adding a freestanding piece of furniture for additional storage. This extra cabinet can be a new piece like you see here, or you could also repurpose an old sideboard, armoire, or dresser. Continue to 10 of 21 below. To maximize the space under the sink, find some clear plastic bins in varying sizes to organize products into groupings. Label each bin with categories like skincare, hair care, dental care, etc. If you don't have shelves under your sink, find bins that are stackable or purchase a unit with drawers. Continue to 11 of 21 below. Opening a bathroom vanity drawer that looks like a junk drawer is not a fun experience. Instead, purchase drawer dividers and group like items together. The drawer you see here stores items that are used every day and any excess products are stored under the sink. Remember, no two drawers will look alike. Curate your vanity drawer with commonly used products that make sense for your family. Continue to 12 of 21 below. Bathrooms are easier to keep clean and organized when there's a spot for everything. If possible, designate a small spot for a hamper, so clothes and wet towels don't end up in a pile on the floor. To save space, roll some clean towels and keep them on top of the hamper. A turntable or a lazy Susan works well for storing lots of products that you want to access often. Instead of needing to reach over something, you can simply turn the base of the stand. If you have multiple types of items to store, add more than one turntable if space allows. Continue to 14 of 21 below. One of the most straightforward ways to hang towels in a bathroom is to add some hooks to the wall. However, many designers are incorporating ladders into modern bathrooms for hanging towel storage. You could also use hooks and hang baskets from the ladder to store rolled up washcloths and other toiletries. Continue to 15 of 21 below. After you put everything away under the sink, chances are there is still some wasted space on the back of the door. To take advantage of this space, attach clear bins to the door and store items you use often. Label each bin and add dates to items that have an expiration date. Continue to 16 of 21 below. In small bathrooms, the space above the toilet is an ideal place to add in some extra storage. If you're having a hard time finding a cabinet that fits or that you like, make your own by repurposing an old window. Since the door is see-through, the trick here is to make your bathroom storage also look like decor. Toilet paper storage is a bathroom necessity, but who said you couldn't have fun with it? Create a toilet paper holder that is one part storage, one party childhood classic game. If you aren't a fan of woodworking projects, there are some ready-made holders you can purchase online. If you're up for a challenge, there are video tutorials you can follow. Continue to 18 of 21 below. Not every bathroom needs to store several hair tools. However, most bathrooms will have at least one hair dryer that you'll need to put somewhere. This bathroom organizing idea uses an over the door rack that is designed to fit wider items like hair tools. The best part is that you don't need to drill any holes. Continue to 19 of 21 below. Most people aren't in a position where they can design a bathroom from scratch. If you are designing a child's bathroom, consider a deep enough niche to neatly store bath toys. If not, there are other options to consider. You can use some strong suction cups and hang baskets that way to store toys. You could also hang an extra tension rod or shower curtain along the back side of the tub and hang toy baskets from there using hooks. Continue to 20 of 21 below. Want to add some personality to your bathroom? Decorate a bathroom countertop with a stylish tray that holds your most loved items. These should be items that you like looking at and that you also reach for every day. Some products to consider include perfume, make up brushes, jewelry from the day, a hand lotion, and so on. This bathroom organizing idea can be completed in under $5 with a trip to the dollar store. You can use strong suction cups or adhesive hooks. Once secured, hang lightweight baskets and store bath products inside. Make sure you test out the strength of the hooks before you load up the baskets with a ton of extra weight.